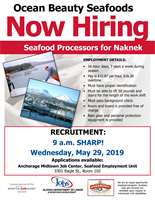 Recruiters for Ocean Beauty Seafoods in Naknek will be recruiting and conducting in-person interviews at The Anchorage Midtown Job Center on Thursday, April 4, 2019 and Friday, April 5, 2019 @ 9:00 a.m. sharp inroom 102. For more information or any questions please contact Sal or Bernie at (907) 269-4746. At-Sea Job Fair Will Be Recruiting At the Anchorage Midtown Job Center! The Seafood Office at the Anchorage Midtown Job Center will be hosting the "At-Sea Job Fair" on Thursday, April 18, 2019 at 10:00 a.m. in room #104. For more information please contact Sal or Bernie @ (907) 269-4746.